My vegetable drawer probably deserves more credit than I do for this dish, so it’s making its appearance as a mid-week inspiration. So here’s what happened… We were packing the night before a three-day vacation and realized that we hadn’t figured out dinner yet. So, I looked in the fridge to see what we had that we could throw together without much effort. I didn’t really see anything to put together as a cohesive meal so I decided I would just make some quinoa and throw on all the leftover veggies we had so nothing would go to waste. But plain quinoa and vegetables needed a little something extra, right? My first thought was to make a quick lemon-tahini dressing, but I wasn’t really in the mood… and then I thought (cue the light bulb) sriracha-mayo! For those of you who regularly read my blog, you might be familiar with my love for sriracha-mayo by now… And in sticking with the flavor theme, I decided to season the quinoa with a little soy sauce. Next thing you know, I was topping the bowl off with some sesame seeds... And there you have it, a quinoa sushi bowl topped with everything but the kitchen sink. The great thing about this is that it can be done in 15 minutes—the quinoa takes 15 minutes to cook and all the veggies can be washed, peeled and chopped during that time. And as long as you’ve got the essential elements like the soy sauce, sriracha-mayo, and sesame seeds on hand, you can use pretty much whatever you want or have on hand in this dish. You can substitute the quinoa for rice if you want and replace whatever veggies I happened to have in the fridge with anything you’d prefer. The possibilities are endless. GO WILD. 3 15 mins. 15 mins. 15 mins. Bring 2 cups of water to a boil in a medium saucepan. Stir in quinoa. Reduce heat to low and simmer, covered, for 15 minutes. After 15 minutes, remove from heat, uncover and fluff with a fork. Season cooked quinoa with soy sauce and stir until combined. While the quinoa is cooking, prepare your vegetables by peeling, de-seeding and cutting everything into uniform sized chunks. 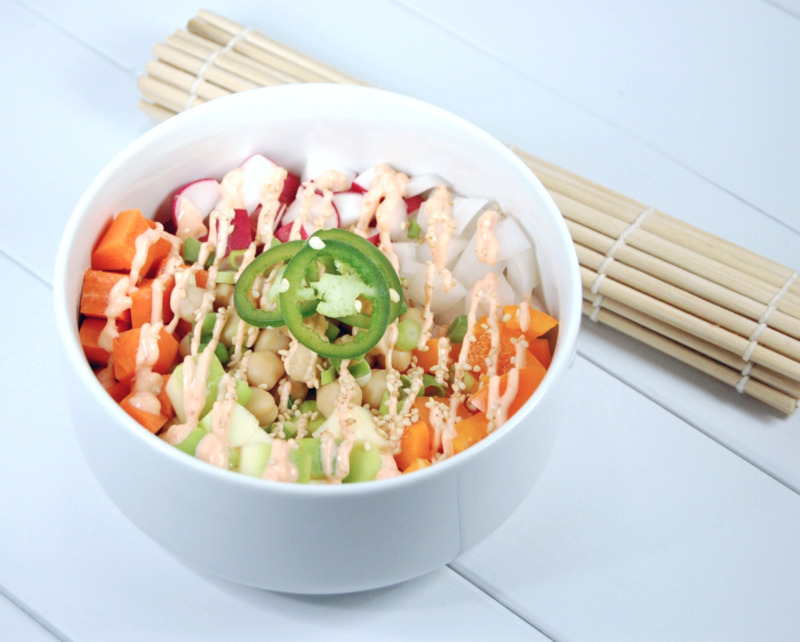 Prepare sriracha-mayo by stirring together sriracha and vegenaise in a small bowl. Once quinoa is cooked and everything else is prepped, top quinoa with desired amount of vegetables. Drizzle on some sriracha-mayo and sprinkle on some sesame seeds. To make a toddler-friendly serving, let your little one pick out the veggies he or she wants and cut them into matchsticks. Serve the veggie matchsticks along with the soy sauce seasoned quinoa and a side of sriracha-mayo for dipping.